Weddings are pricey and it seems like as soon as you say “it’s for a wedding” the price magically doubles. If you aren’t careful you can dig yourself into a bit of hole. To be fair it’ll be a magical, beautiful hole but a hole nonetheless. If video is on your list of must-haves but you love a bargain then I’ve got a few tips for you. Buy a couple rounds of drinks while on your honeymoon instead. If you know you are getting married in 18 months and there is a videographer’s style you like, book them. The longer a videographer has been in the game the better they are (in most cases), so they tend to charge more. With every year of videography under their belt, the more cause for a cost increase. If you book early, chances are they’ll be cheaper than if you booked the same videographer 3 months in advance. 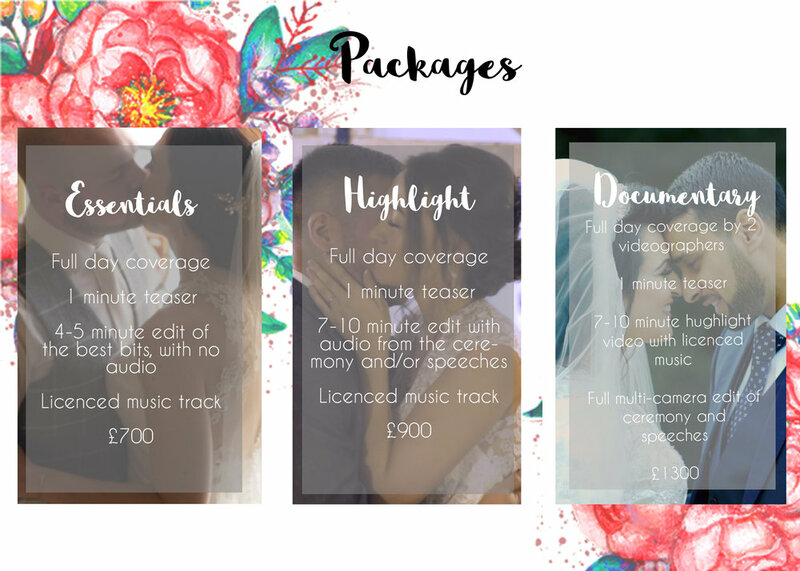 They need to honour the price you agreed to so they could be be filming your wedding one day and another person’s the next and for the same package, the other couple could be paying £100-£500 more than you did. Plus if you like them now, they’ll be even better by the time your wedding comes around. If a videographer offers a 20 minute video as a part of their package. Ask if they can do a 10 minute edit instead. A videographer bases their package in day rates. 50% fewer clips to colour grade could result in a day less work for them, and save you around £150. But just remember that 50% of the clips, doesn’t automatically mean it would be 50% less work for them. They still need to work the same amount of hours on the wedding day, sift through the same amount of footage, and determine the story structure (all of which is very time consuming). Also is a videographer only offers a 5 minute highlight edit, requesting a shorter edit may not be in your best interest. If you are happy with a minimalist edit, tell your videographer to show up 30 minutes before the ceremony and leave after the speeches. Granted there won’t be any prep or party shots, but there will be the romantic couple shots that add a lot of style, and all the important stuff will be covered. If a videographer has another wedding booked the day before, they’d love not having to get up at the crack of dawn.Chances are they’d reduce their cost by £50-£100. Capturing sound from the ceremony and speeches can be very stressful on the day and syncing sound and listening for the best sound bites eats up time when editing. 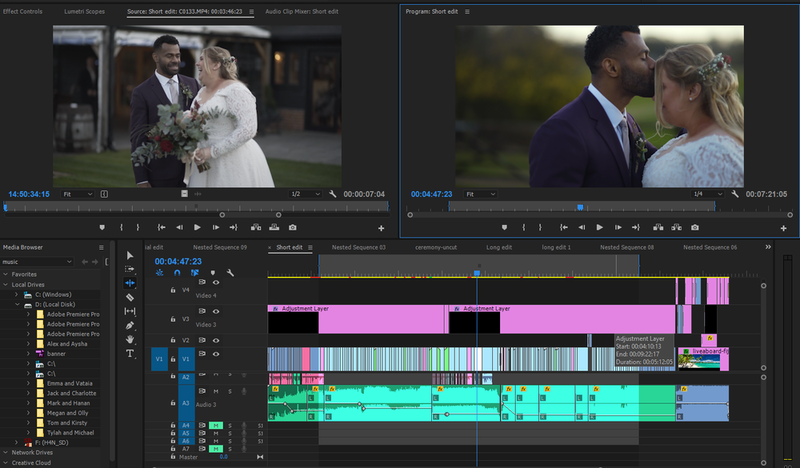 It is considerably easier to do an edit that is made up of beautifully shot clips timed to music, and still results in a great wedding video. If there is a high change of a crying baby, or super nervous speech-giver than no audio might be a smarter option. And if you are getting married smack-dab in the middle of wedding season, most videographers would welcome this kind of request as it can alleviate some edit pressures. At Bright and Beautiful Films, you can save yourself £200 for opting out of sound. If you love a videographer’s style but they need to travel a long way they may bill for the mileage and possibly a hotel room for the night before and the night of. That can get pricey. Email that videographer you like and see if they charge extras like that, because some don’t. But if they do maybe consider finding someone nearby that can deliver a video you’d be happy with. You just may need to come to terms with the fact that they may not give you exactly that you are looking for. Giving them no deadline- If you aren’t fussed about a quick turnaround, this could be valuable to a videographer with a lot on their plate. Offer a service for a discounted rate- Are you a masseuse? Offer a massage. A mechanic? An MOT- you get the picture. We’ve all got things we want and need. Get creative. Ask for no-edit: If your cousin/best friend/neighbour is a rock-star filmmaker/editor but you don’t want to put them to work on your wedding day, hire someone to film the wedding and hand over the memory card at the end of the day. That way your cousin/best friend/neighbour can do the edit instead. 2 caveats. 1- most videographers have a lot of pride in their work and want the footage/edit for their portfolio so you might need to ask a lot of people before you find someone who will do this. 2- when you ask your editor to do it for cheap/free you’ll have less control when it comes to amends. There you go, just a few hot tips to help you plan your wedding video. I hope you get exactly what you are looking for at a cost that doesn’t break the bank.